Good Reason or Racism? Public Service or Public Display? Paul’s rendition of the events involving last night’s City Council meeting is spot on. Councilman Reed did read such a letter. My thought on that subject comport to those of Alice and Michelle. I had another councilman bring up receiving a nasty gram or two on this subject just like when Mrs. Arnold was appointed last July with Councilman Seal bringing up such an instance. Nasty grams and school board appointments have that time honored pattern in the Bay. So much effort for so little per diem indeed. Folks, Hancock County got to watch the Courtney Thomas library drama unfold last year, so predicting a bad spinoff show for this year’s spring season for the school board seat involving Momma was a no brainer as was predicting it’s cancellation. That said it takes both talent and dedication to alienate both the Hancock County Board of Supervisors and the Mayor of the County’s largest City. In any event, for all the posturing we saw at last night’s meeting, the City Council members that were very critical of the Mayor’s choice of Ms. Lathrop didn’t seem to want to discuss any of the Mayor’s reasons for letting Ms. Thomas go after two years of service and replacing her with Ms. Lathrop. I reckon it was easier to play the race card than to discuss actual issues. Voting against Ms. Lathrop’s appointment were Councilmen Reed and Zimmerman with Councilman Seal attempting to have it both ways. Author Douglas HandshoePosted on March 7, 2018 Categories SopTags Bay St Louis City Council, Bay St Louis Mayor Mike Favre, Bay Waveland School Board Trustee Ann Lathrop, City of Bay St Louis, Former Bay Waveland School Board Trustee Joan Thomas, Race Card, Racism20 Comments on Good Reason or Racism? Public Service or Public Display? It’s for true folks and sources with knowledge of the settlement indicate the cost to the City to get rid of this lawsuit was frightfully high. I hope all of the officers involved in terrorizing Mr. Koenann have been shown the door though I do not believe that is the case here. This location must be cursed, rumor holds by an undiscovered poltergeist type of Native American burial ground for all the controversy it has caused. For instance it seems like just yesterday…..
Is it too high of an expectation these days for the concern for public safety and being a good neighbor to trump politics and personal agendas for just one day out of the 365 that the Good Lord blesses us with this year? WLOX reported Friday that Bay St. Louis Mayor, Mike Favre, has decided not to assist the City of Pass Christian with 4 off duty Bay Police Officers for crowd control at the St. Paul’s Carnival Association Mardi Gras Parade. Mayor Favre contends he needs all of his force in the Bay to protect their citizens. Mayor Favre may want to consider the fact that a very large number of his citizens will be in Pass Christian tomorrow for the infamous “Pass Parade” which draws the largest crowd of any parade on the Coast, and is historically the most volatile. Year before last two people were shot and killed at the parade, and this was not the first time violence was an issue for this event. I bring many years of experience auditing to this project and that is how I approached the Denardo payroll fraud story. Before an auditor can assess individual transactions, professional standards require gaining an understanding of the internal control environment surrounding the transaction stream. Internal controls are the policies and procedures an entity uses to conduct business, in this case being the policies and procedures Bay St Louis used to generate payroll. Auditors gain this understanding by reviewing written policies and procedures, interviewing people involved in the internal control process along with a walk-through. It makes sense because to breathe life into financial transactions it helps greatly to understand the process that creates them. 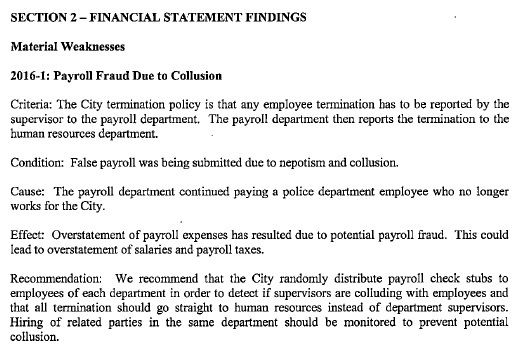 I relied on interviews with two former employees that have requested anonymity who have a detailed knowledge of the City’s payroll processes dating to the time Chief Denardo took his own life and what follows is directly based on those interviews. The first step to being able to draw a paycheck is being listed on the annual payroll ordinance and I examined those going back to the year ended September 30, 2013 and sure enough Patricia Denardo was listed as a reserve police officer without fail. With that basic step understood the payroll process at Bat St Louis consists of two major parts. 1. The Employee turns in a time sheet to their supervisor, in the case of the Bay PD that would have been the Patrol Captain. 2. After approval the time sheet was sent to the Records Clerk for entry. 3. The Chief of Police approves and sends to City Hall for payment. 1. The time is received by finance, balanced, prepared for payment and sent to the Mayor for Approval. 2. Once approved by the Mayor, the payroll is generated including a direct deposit file which sent to the bank for payment. Excerpt from City of Bay St Louis draft 2016 audit. Their findings were that fraud had occurred, that the fraud was committed by Chief De Nardo through the processes of payroll to his personal account. They cleared Patricia De Nardo in their investigation, she was not complicit in the fraud. They determined that there was no other person involved in the fraud. Did the FBI truly tell Trent Favre that Denardo acted alone with “no other person involved in the fraud”? My informed opinion is no way folks as Favre was whitewashing what happened and blamed the dead man, which is easy to do considering the circumstances plus he is contradicted by the City’s own audit firm who used the term “collusion” to describe the events. Slabbed New Media is conducting its own investigation into the events leading to the suicide of Mike Denardo as a police department that was seething with corruption imploded under the weight of years of lies and deceit. I have interviewed sources close to the investigation as well as several former City employees that have requested anonymity due to the sensitive nature of the subject matter and fear of reprisal. I also spent the better part of Wednesday at the Bay St Louis Council chambers combing through years of official Council minutes. I’d like to personally thank Mayor Mike Favre, who ultimately declined to be interviewed about this topic but who ensured the complete and total cooperation of the City and Deputy Council Clerk Caitlin Thompson, who assisted on Wednesday fetching the 8 or 9 minute books. The City Council has two keepers in Council Clerk Tilley and her Deputy Clerk Ms. Thompson. Ultimately I scheduled payroll transactions that were done in Ms. Patricia Denardo’s name stretching back to 2014 and it was very clear from the annual salary ordinances that she was being paid back to the previous City Council in 2013. Those early records were fragmentary but I still managed to schedule 65 paychecks totaling $78,209.71 gross payroll that were issued in her name. We also obtained Ms. Denardo’s salary history from FEMA dating to 2008 which indicate she started with FEMA in late 2007 at GS-11 on the federal salary scale. Notably Ms. Denardo’s own LinkedIn page contains work dates that correspond to the salary information Slabbed obtained via FOIA. There is much work that remains to duplicate the FBI investigation within the constraints of not being able to obtain warrants so this project is ongoing but we will not stop until the Citizens of the Bay St Louis get some much needed transparency on how the City ran under former Mayor Les Fillingame. Who Dropped the Dime on Chief Denardo? Inquiring Minds Want to Know…. Favre said that someone from within the city anonymously reported the fraud to the Hancock County Sheriff’s Office. After the report, the sheriff’s office in conjunction with the FBI conducted an investigation, he said. “The FBI determined he and he alone did the payroll fraud and gun sales,” Favre said. Author Douglas HandshoePosted on December 21, 2017 Categories SopTags City of Bay St Louis, Former Bay St Louis Police Chief Mike Denardo, Payroll Fraud17 Comments on Who Dropped the Dime on Chief Denardo? Inquiring Minds Want to Know…. The City of Bay St. Louis is seeking to hire an attorney. The candidate will Work under the direction of the Mayor & City Council. The City Attorney is the legal adviser & attorney for all officials, officers, & departments of the City & represents the City in all litigation & proceedings. Work involves drafting & reviewing ordinances, resolutions, policies & procedures, & contracts prior to consideration by the City Council to ensure compliance with state, federal, & local laws. Emphasis is placed on municipal law, civil code enforcement, land use, Zoning, labor relations, & legislative interpretation. Duties include researching / preparing oral & written legal opinions for City Council, Mayor, Department Heads, staff, committees, commissions & boards, & preparing city ordinances, resolutions, contracts & other legal documents involving the City. Should have 10 years of experience. Must have knowledge of labor relations, civil litigation, municipal, state, federal and constitutional law affecting municipal government. Must be skillful in managing situations requiring diplomacy, fairness, firmness & sound judgement, providing coaching to improve staff performance & understanding / applying City policies & procedures. Doctor of jurisprudence degree from an accredited law school. 10 years experience in municipal law is preferred. Must be licensed by the State Bar of Ms. Resumes & cover letter should be mailed or hand – delivered to the office of the Mayor, City Hall, PO Box 2550, Bay St. Louis, MS 39520 by December 13 , 2017 for consideration. The Bay St. Louis City Council on Tuesday approved a motion to extend the $13 fee on utility billings through Dec. 31 to satisfy a payment to FEMA for the Beach Blvd. sewer, drainage and lift station project. Mayor Mike Favre told the council that MEMA owes the city about $168,000 for the Rutherford Pier project. “We write the check back to them and they give it back to FEMA,” Favre said. The city owes FEMA about $238,925, he said, for the Beach Blvd. sewer, drainage and lift station project. That would leave the city owing $70,000, which is due by March 31, Favre said. Favre said the second appeal to FEMA for engineering costs reimbursement was denied in December 2016. We are waiting for a press release from the Mayors office on this latest development. Stay tuned.